In the next 20 years, between 50 percent to 100 percent of the world's energy production could come from solar. Today, the global oil and natural gas industry is about a $4 trillion business. It's big money, and in the U.S., 67 percent of the electricity generated in 2015 was from fossil fuels (coal, natural gas, and petroleum). We are on the cusp of a solar revolution where the cost of solar cells will plummet, efficiency will rise dramatically, and the incentives for widespread adoption will become compelling. This blog is Part 1 of 2 about the exciting developments happening in solar. Today, we'll focus on a recently discovered material called perovskite and its massive implications to society. Over the past few decades, the most widely used form of solar energy has come from a material called silicon. The silicon solar cell was discovered in 1953. A few years later, the first commercial solar cells began to pop up. Unfortunately, these first commercial cells were way beyond the means of normal consumers and were also relatively inefficient at producing energy. Over the decades, silicon solar cells have become increasingly more affordable and efficient, with most solar panels averaging around 14 percent to 18 percent efficiency (up from 6 percent back in 1954), and as low as $3 per watt (down from a staggering $300 per watt in 1956). Although solar energy currently only accounts for 0.4% of electricity generated in the U.S., solar energy production is expected to grow significantly over the decade ahead. Domestically, the market is projected to grow 25 percent to 50 percent this year and global projections are at 30 percent. 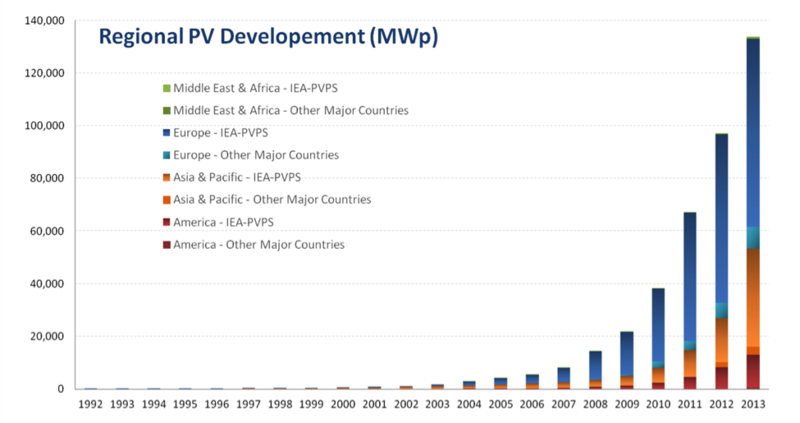 The graph below illustrates how global photovoltaic development and capacity has increased over the years. The implications of this are staggering, both on an economic and environmental level. And, for those who want to do the calculations, at a 30 percent annual growth rate, it looks like this: In five years, we go from 0.4 percent to 1.5 percent. In 10 years, we're at 5.5 percent. In 15 years, we're at 20 percent, and in 21 years, we're at 98 percent. But what's even more interesting is a new material that's poised to completely change the face of solar... and with that, let's dive in. At Abundance 360 this year, Jeff Carbeck, the head of Advanced Materials at Deloitte Consulting, introduced us to an extraordinarily exciting new material called Perovskite. Perovskite is a light-sensitive crystal that has the potential to be more efficient, inexpensive, and versatile than all other existing solar solutions to date. Over the past five years, perovskite's conversion efficiency has increased dramatically -- from 4 percent to nearly 20 percent, making it the fastest developing technology in the history of photovoltaics. Scientists started experimenting with perovskite in 2009, using it as a dye to absorb light and create charges, which could then be separated and used to generate energy with a semiconductor. In 2012, however, scientists realized that perovskite could actually act as a semiconductor itself, and began to experiment with using it in solar cells. Because of how perovskite is created, perovskite solar cells have a few important advantages and disadvantages over silicon-based cells. Cost: The ingredients used to create perovskite are widely available and inexpensive to combine, since it can be done at relatively low temperatures (around 100ºC). Silicon cells need to be heated to high temperatures (as high as 900ºC) to remove defects, which is a costly process. Estimates suggest that perovskite solar panels could cost just 10 to 20 cents per watt, compared to 75 cents per watt for traditional silicon based panels -- anywhere from 3X to 8X cost savings -- making solar panels much more affordable for the average consumer. Versatility: Perovskite rolls have a thin, flexible and lightweight structure due to this processing, unlike silicon wafers, which tend to be thick, heavy and rigid. Because of this versatility, perovskite could theoretically be placed on roof shingles, windows or pretty much any surface imaginable. This versatility is what could enable solar to reach a scale that eventually eliminates dependence on fossil fuels entirely. 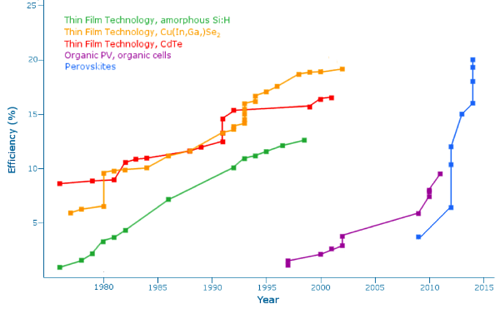 Efficiency:As mentioned above, perovskite’s conversion efficiency has increased at an astounding rate over the last five years -- from 4 percent to nearly 20 percent. And this is just the beginning -- the theoretical limit of perovskite’s conversion efficiency is about 66 percent, compared to silicon’s theoretical limit of about 32 percent. Look at the chart below. Safety: One of the components of perovskite is lead -- a highly toxic metal. As a result, any perovskite solar cells would have to undergo extensive testing to make sure that lead wouldn’t be a risk factor. Researchers have noted, however, that the amount of lead present is relatively low, and would likely have a very minimal negative environmental impact. Two labs have also been able to produce lead-free perovskite cells that swap lead out for tin, which could eliminate the concern entirely. Durability: This is a big sticking point -- perovskite degrades in hours when it comes into contact with moisture -- as opposed to silicon-based cells, which come with 25-year warranties. New research is promising, however. Researchers have created a new perovskite photovoltaic which actually removes the layer that tends to degrade, creating a material that has proven to be stable for more than 1,000 hours of operation (after which researchers stopped testing!). One interesting solution is to combine perovskite with other photovoltaic materials to create more efficient systems. Scientists in Hong Kong recently reported having successfully combined perovskite and silicon to create a tandem solar cell with the world's highest reported efficiency rate – 25.5 percent! "As there are different wavelengths for solar energy, a combination of different materials for making solar cells would work best for energy absorption." "For example, methylammonium lead tri-halide perovskite and silicon solar cells can form a complementary pair. With the perovskite solar cell functioning as a top layer, it can harvest the short wavelength photons while the bottom layer coated with silicon is designed to absorb the long wavelength photons." The world has long had high hopes for solar, and it seems that potential may finally be close to being realized. Once again, there is 5,000 times more solar energy hitting the surface of the Earth than the human species uses in a year. The barriers to commercial development, however, are still significant. Many entrepreneurs and investors are cautious about solar after having been burned in the early 2010s, when a string of solar companies took in considerable capital before shuttering their operations. That being said, there has been a resurgence of promising startups developing commercially viable solar solutions – and we believe we'll see perovskite solar cells as early as next year. New developments are occurring every day, pointing towards a future with abundant energy, abundant clean water and abundant possibility. This is an incredibly exciting time for material science, and an incredibly exciting time to be alive. P.S. Every week I send out a "Tech Blog" like this one. If you want to sign up, go here and sign up for this and Abundance Insider.